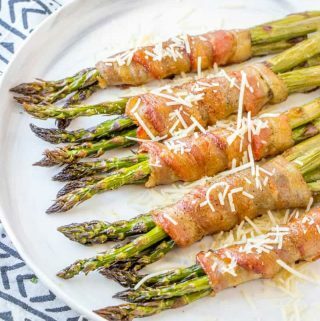 A light and tasty favorite, this Bacon Wrapped Asparagus is a quick and easy recipe that is a crowd favorite and pairs nicely with any meal! Trim about 1" off of your asparagus ends and then spread onto a baking sheet. Drizzle with olive oil and sprinkle with salt and pepper and toss to coat. Grab about 3-4 spears and wrap with bacon and place seam side down onto baking sheet. Bake for about 30 minutes until bacon is cooked. Remove from oven and sprinkle with parmesan if desired.